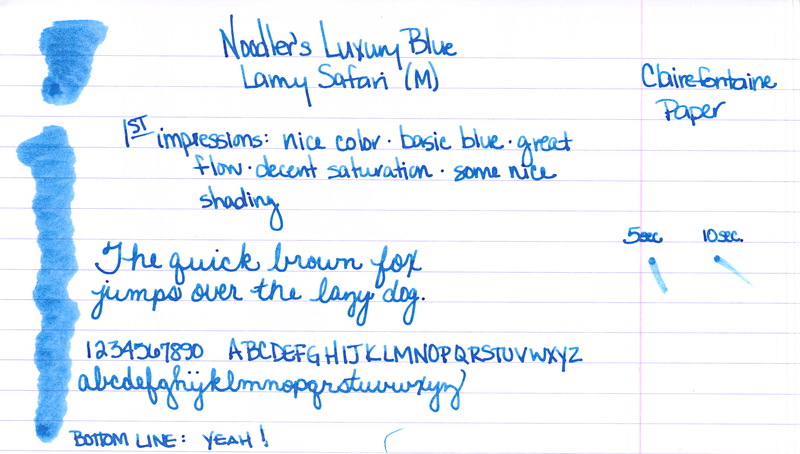 A handwritten review of Noodler's Luxury Blue fountain pen ink. Noodler's Luxury Blue is from the line of Noodler's Eternal Inks. That is, they are meant to be water, light, and (yes, folks) even bleach-proof. These forever inks are sometimes referred to as bulletproof and fraud-resistant. While I won't take the time to list them all here, here's a link to the bulletproof inks that Goulet Pens carries. A good medium blue with some nice shading. No flow issue or other complaints from me. Some reviewers have published pictures and statements that indicate that the ink is more dusky/chalky than I have shown here. This is a little surprising to me because while the ink is not super-saturated, the color is definitely clear and bright. 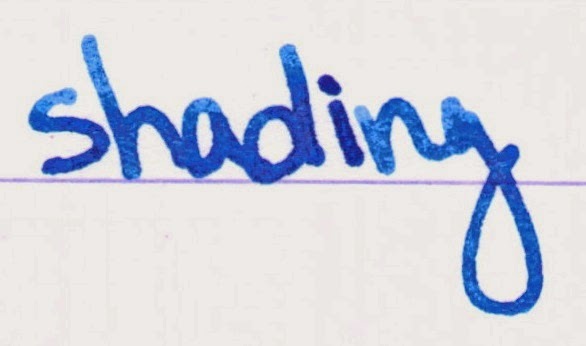 Noodler's Luxury Blue is an expensive ink. As of this writing, it is $13.50 for one ounce at Goulet Pens. Meanwhile, another bulletproof ink (Bad Belted Kingfisher) is $12.50 for three ounces. Bottom line: I like it, I don't love it. Have you tried this ink? I'd love to hear your thoughts.